This book attempts to conceptualise EU action in the field of regional security. Drawing on constructivist theory, the framework of the book focuses on the meeting - or 'interface' - of actors, a situation reflecting the mutual construction of self, other and situation. The analytical framework applied here to European security politics is potentially open-ended as the theoretical logic that informs the framework is general and abstract in character, and not limited to state actors in an international setting. 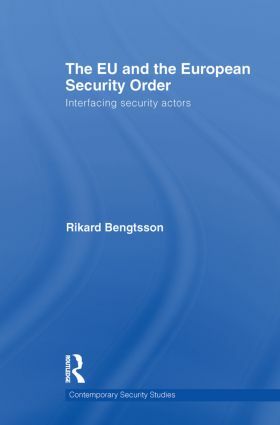 The empirical aim of this book is to further our understanding of the EU as a security actor in a regional perspective. The book thus links International Relations scholarship with that of EU studies. By analyzing a number of different interfaces (such as with Russia, the US, and other states), we can learn more about the circumstances and preconditions and with what resources and power the EU acts in a regional security setting. This book will be of great interest to students of European security, EU policy, IR theory and security studies in general. Rikard Bengtsson is Assistant Professor of Political Science at Lund University, Sweden. He has a PhD in Political Science, from Lund University, Sweden.